We lead pretty good lives, so there isn’t much to lament. In fact, I often think that if a Genie were to appear offering me the chance to magically change anything in my past, I’d have to politely decline the invitation (politely, because it’s never a good idea to piss-off an all-powerful Genie). After all, everything in my past leads to this present, which I happen to think is pretty great. If I made different choices along the way, I wouldn’t be where I am today. And who’s to say that would be better? I happen to think it probably wouldn’t be. None of that, however, prevented me from gritting my teeth in regret at having traded in our old Audi as I tried to navigate our Jeep through the crazy winding roads that took us from Silver City, NM, to Gila Cliff Dwellings National Monument. Every hand-over-hand turn screamed for an automobile with tighter cornering and better downshifting ability. I knew I was overtaxing the Jeep’s abilities when I started to smell burning breaks. With great sadness, I had to ease back on the throttle. Meantime, our iPod random shuffle kept selecting classical music, making the entire episode feel like a Lexus commercial. I’d like to think the iPod missed our old car too. More likely, it was just mocking me. I hate parting with my cars .. it’s a real physical wrench. One degree of separation. So many connecting thoughts emerging from your short post: the winding Road to Hana on Maui; missing my ’67 Olds Cutlass Supreme which got 9 mpg and needed more $ for repairs than I could afford to channel in its direction (Jay Leno, I’m not): classical music playing during a high-flying ride over the San Juan Islands in a biplane; pondering where I’d be if I’d made different choices along the way but being glad I didn’t; and making a mental note to visit the Gila Cliff Dwellings National Monument. Totally enjoying your thought-provoking posts. We’ll be putting up a post on Gila Cliff Dwellings shortly, so check back soon for more. Thanks, Brian. Checking back—that’s a given! Great Post! It reminds me of the time that we decided to take a shortcut to bypass Bakersfield, California. We had a tent trailer on the back of our pickup when we came across (1) 13% grade and (2) 17% grades on this shortcut road. You have that oh crap! moment and keep moving forward because there was no way to turn around. Have a Great Day! Oh my. I think at 17% grade my RV either goes backward or careening uncontrolably forward. That’s just a guess. One that I don’t want to test. I know the post is more about the journey and not the destination, but I’ve always wanted to go to New Mexico. Hope you’ll write more about it! This is our second pass through NM. It’s a lovely state. You’ll find all of our previous NM posts in the link below. You’ll find new NM posts front and center at EverywhereOnce in the days ahead. You make an excellent point about not wanting to make any changes in your life because then you wouldn’t be where you are today. I agree. Sorry to hear about your car trouble. Don’t know how an Audi rides, but a Jeep I drove just made me feel every bump along the road. No fun. 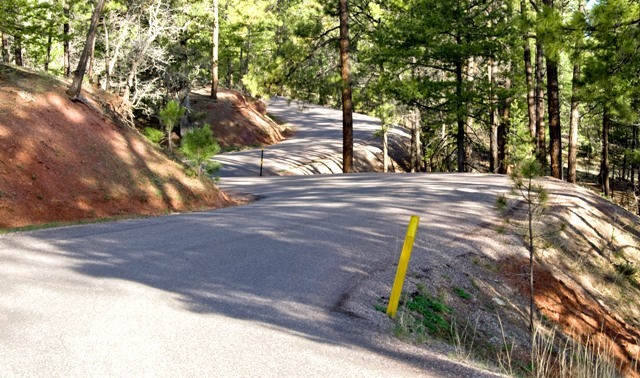 Until we made that trip on NM State Highway 15 from Silver City, I was under the obviously incorrect assumption that all “State Highways” had center stripes, cleared shoulders and an occasional guard rail. The drive was highly educational. Ha. It gets worse if you continue on to the nearby Mogollon “Ghost” Town, although I think much of that is off the State Highway. We made that drive as well. I heard the big wildfire in NM forced “all” the residents of Mogollon to flee. Hope it missed them. We went through a couple of weeks ago; before the fire. As I understand it, they still have the area evacuated. The fire is only 5% contained and people are starting to worry about flooding when the “monsoon” season comes. Really unfortunate.